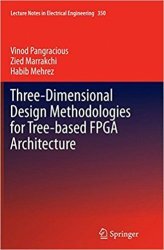 This book focuses on the development of 3D design and implementation methodologies for Tree-based FPGA architecture. It also stresses the needs for new and augmented 3D CAD tools to support designs such as, the design for 3D, to manufacture high performance 3D integrated circuits and reconfigurable FPGA-based systems. This book was written as a text that covers the foundations of 3D integrated system design and FPGA architecture design. It was written for the use in an elective or core course at the graduate level in field of Electrical Engineering, Computer Engineering and Doctoral Research programs. No previous background on 3D integration is required, nevertheless fundamental understanding of 2D CMOS VLSI design is required. It is assumed that reader has taken the core curriculum in Electrical Engineering or Computer Engineering, with courses like CMOS VLSI design, Digital System Design and Microelectronics Circuits being the most important. It is accessible for self-study by both senior students and professionals alike.